Melbourne’s hippest 15-piece big band is bringing their exciting sound to Hawthorn Arts Centre for one night only. ATM 15, led by music director and composer Andrew Murray will take to the stage on Friday 9 June along with special guest appearances. Andrew Murray leads the fresh sounding big band as a part of their soon to be released and long awaited third album. Past albums, Big Band Reborn and Human Music, earned critical acclaim and showcased Murray’s talents as both musician and composer. Having won the inaugural National Big Band Competition for composition in 2009, Andrew went on to form ATM 15 as a vehicle for his own compositions and arrangements, featuring some of Melbourne’s top improvising musicians. Combining jazz harmony, orchestration and a contemporary soul sound, ATM 15 promises to be an exciting arrangement of original composition from some of Melbourne’s best. 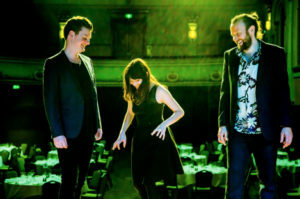 A unique musical experience in a cabaret style atmosphere, complete with the opportunity to purchase gourmet cheese platters and selected drinks, Hawthorn Arts Centre plays host to a decadent musical experience. ATM 15 is “individual, refreshing and cliché free” (Ed Partyka, Composition professor at the University of Music in Graz). Andrew’s conduction and composition bring together these talented musicians that make this performance one not to be missed. ATM 15 is coming to Melbourne with a bang for one night only. Experience the revival of the Hawthorn Arts Centre’s original grandeur and glory with the big band experience.